Everything went smoothly, Dave Schilli took care of everything while we were away at our home in Sanibel FL. THANK YOU! The new finish on the pool looks great. It is my favorite part of the pool redo. Your guys were professional and conscientious. A special thank you to Janice for your help through the process and especailly your patience and upbeat attitude. Dave Schilli has an excellent reputation and deservedly so!! “Elmer Schilli, Plastering Contractor”, was established in 1950 by its founder, Elmer Schilli. After serving 2 years in WW II, based in Italy, he returned home to his wife and renew his love for the plastering trade. He started his own business in 1950, and would work on the jobs (with his 4 employees) during the day, and do his estimating and office work in the evenings. In 1976, the company incorporated and became Schilli Plastering Co.. At that time, current president, Dave Schilli took control and Elmer remained as vice president. 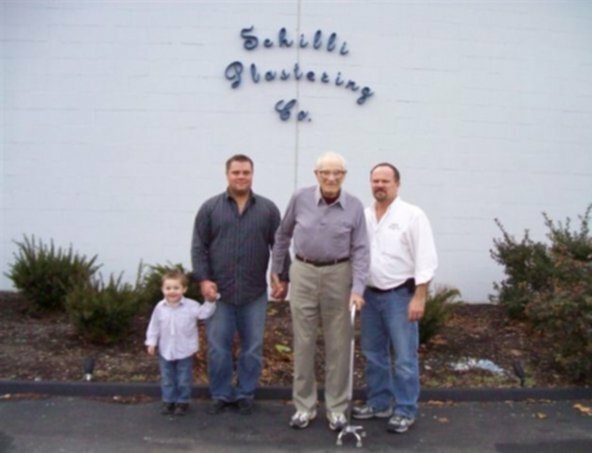 So even today, Schilli Plastering Co. (with its’ 40+ employees) has remained a family-owned company, with 3rd and 4th generations waiting in the wings to continue the mission statement established by Elmer Schilli 60 years ago. That statement being; “to furnish the finest quality products and service to our customers more efficiently and economically than our competitors”. From the smallest details to the largest, most difficult projects, Schilli Plastering meets the same strict standards developed by its founder, as well as providing professional service, quality workmanship, and endless customer-friendly service. Every field employee who works for Schilli Plastering is bonded and fully insured with liability and workers compensation. All are members of Plasterer’s Local 3, or Laborer’s Local 110, and have gone through rigorous training during their apprenticeship. Many of our journeymen have 15 years or more service with our company. Every man, down to our youngest employee, knows that “customer satisfaction is our #1 goal”.